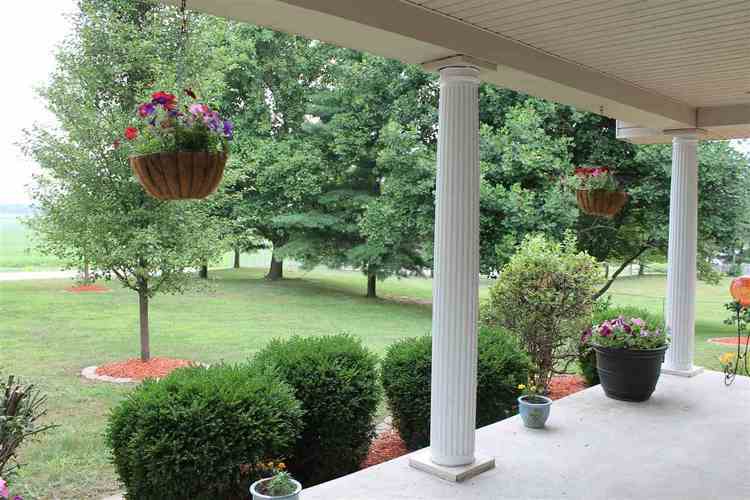 Nicely maintained and UPDATED home with 2.6 acres. Geothermal heating/cooling system. Updated kitchen with newer cabinets (include pull out drawers and are soft close), Quartz countertops and ceramic backsplash. Fantastic window above sink lets in plenty of light and offers a great view of the well landscaped backyard. Newer roof (approx. 5 years ago & tear off). Large sunroom ( that has extra electric heat) features an abundance of windows and a unique cedar-plank ceiling. Master bath has been updated with tile flooring, double vanity and large swirl tub. Newer Laura Ashley laminate flooring in all bedrooms. Bedroom #2 features its own private bathroom. Finished daylight basement with recessed lighting. Beautiful backyard with stamped concrete patio. 2 water heaters, humidifier. Large, open front porch complete with columns. Barn also on property. NOTE: Square Footage includes the heated sunroom. Flower containers, pots and ornamental landscaping pieces do not remain. Propane tanks on property. Valves for propane in living room and sunroom. Supplemental heat in sunroom and basement is electric. New well pump August 2018. Septic pumped August 2018. Seller's have had geothermal system on an annual maintenance plan from HVAC installer (Huntington Heating). Located minutes away from GM, I69, U.S. 24 and more! !